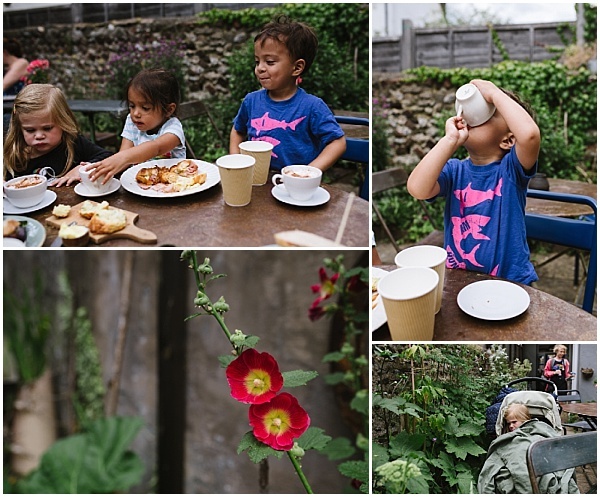 Last week I took the twins to Brighton to visit Laura and her daughter, Arla. We went to a soft play first so the toddlers could burn off a bit of energy before we decided it was time for lunch. 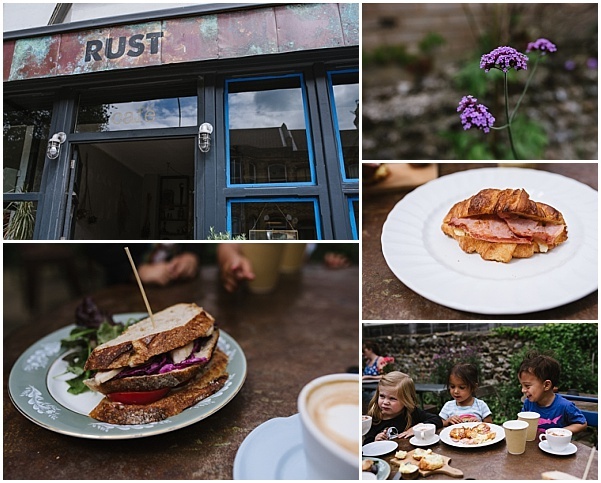 The original cafe Laura had planned to take us too was already full so we went to Cafe Rust on Preston Road which she'd planned on trying and we're so glad we did! It was absolutely gorgeous! 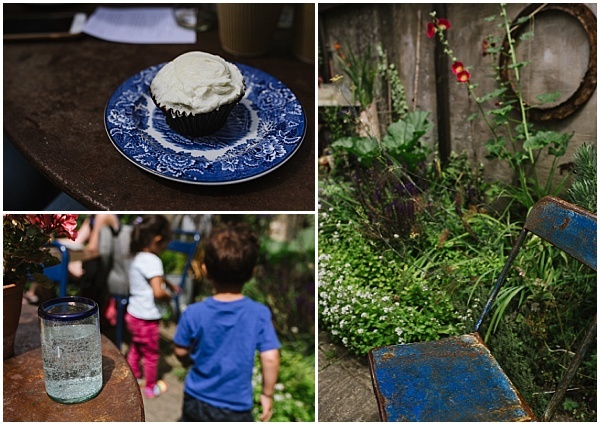 As soon as we walked in and saw the door at the back opening out onto a garden we headed straight through and walked out into a beautiful little walled garden full of flowers and blue chairs and wheelbarrows. It was lovely! We settled around the table in the corner and ordered our food. I went for the club sandwich I could see on the counter which had chicken, home-made red cabbage coleslaw and big thick cut pieces of bacon. A triple-decker made with sourdough bread, it was epic! Laura joined me with the club sandwich and we ordered a bacon & cheese croissant and a cheddar & chive scone for all the kids to share. I was amazed that the huge sandwich, which came with dressed green leaves, was only £5 - I can honestly say it was one of the most amazing sandwiches I've ever had! SO delicious! Laura agreed and we nibbled the kids food as well, the croissant and scone were also amazing. 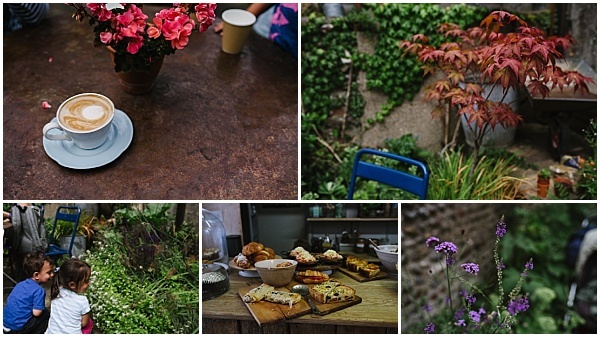 I would definitely recommend it if you're looking for a little oasis to chill out in in Brighton. They also host pop-up restaurants with visiting chefs in the evenings. 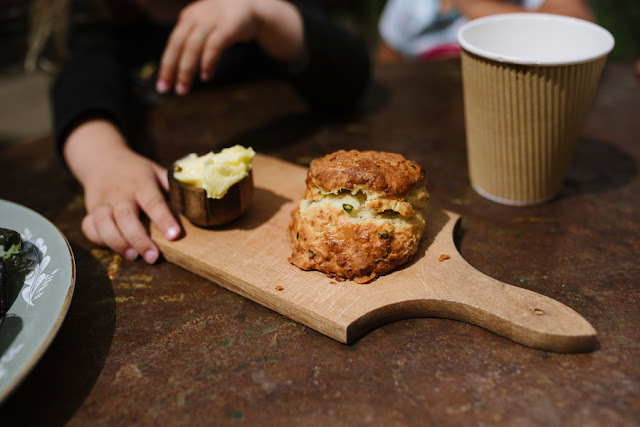 As I had a latte, the kids all demanded babyccinos too and we had tap water until we got so hot basking in the sun we ordered more cold drinks for ourselves. The twins loved watching the bees buzzing around the flowers but poor Arla was very tired so snuggled up in her buggy until she saw it was time for cake! The five of us all shared two chocolate cupcakes with cream cheese icing. They were lovely and the other cake choices looked pretty good too! We will definitely be going back, Nik is desperate to try it after I've been raving about it and it was such great value for really good food. 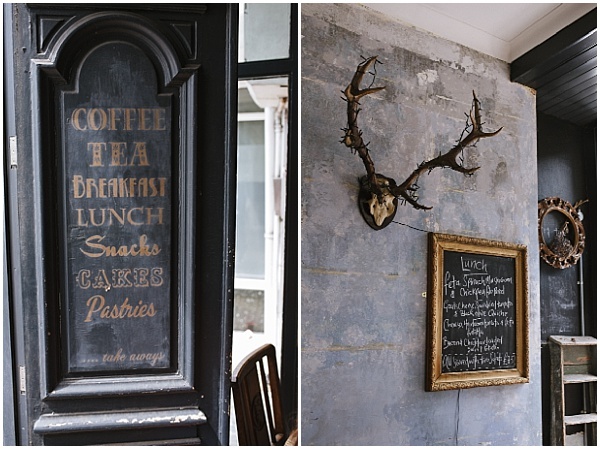 I think we might have to do some more exploring in Brighton to see what other great finds we can uncover. Do you have any tips for more places we should try?